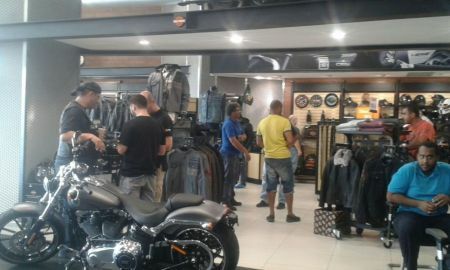 The H-D MY16 Open House in Dhahran was held on Saturday October 31st from 12:30pm to 8:00pm. During the event, attendees were delighted by the unveiling of MY16 Motorcycles. The team took Harley®enthusiasts through the new 2016 model year motorcycle ‘specs. Families gathered and enjoyed lots of games, activities, and gift giveaways for kids; a clown was even brought to play with them while their parents were checking out new MY16 mototcycles. Visitors ware excited to take part in the demo rides while snacks and refreshments were offered throughout the day.